The general topics of JEERP are the creation of an energy balance and the optimization of the energy consumption for an enterprise environment. Hence JEERP can administer and monitor energetic assets to analyse, simulate and report the energy consumption. Moreover JEERP can exchange information or also optimize energy control according to the connected ERP. An enterprise environment comprises diversified devices e.g. information technology, building automation including heating or light control, various kind of industrial objects or may be a vehicle pool. Thus it appears that the term energy is abstract and don't stands only for electricity, but also for petroleum, gas, water or anything else. JEERP will observe and summarize any kind of energetic consumption from also different network topology and technology as e.g., domotic or company structures. The diagram aside illustrates in general the context of JEERP and presents the gateways to interact with an enterprise environment. A device is an energy consuming unit of any dimension within an indoor or outdoor environment. A device can be active to communicate with or passive to get called by other devices. Its consumption values can be provided at real time or only as samples. JEERP will support the range of devices from including manually inserted estimation consumption until automatically calculated real consumption and provides several interfaces to take over the values. 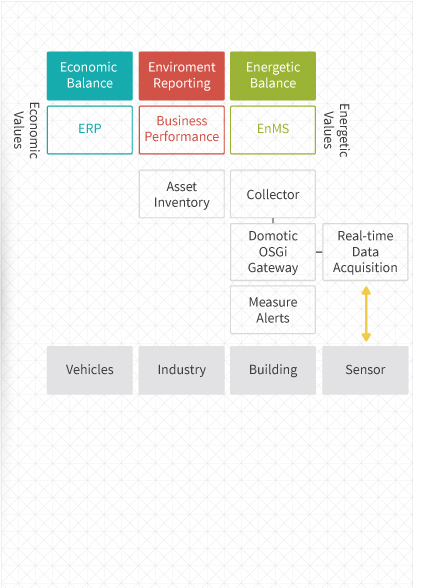 The energy manager can access the data of consumption stored to build the energy balance, or for analysation, or reporting, or simulation.